Therapy Content/Therapy Studios once again joins forces with Dave Grohl and Roswell Films to present “Play,” a mini-documentary that culminates with the Foo Fighters founder performing a solo 23-minute instrumental of epic proportions. Directed by Grohl with help from his Sound City / Sonic Highways collaborator Mark Monroe, “Play” is a two-part film celebrating the rewards and challenges of dedicating one’s life to playing music. “Play” is the newest product of the longstanding creative collaboration between Therapy Content Executive Producers John Ramsay and James Rota, and Grohl, the EP of Roswell Films. Part one focuses on Grohl’s preparation, intercut with footage of students from the Join The Band music school in the San Fernando Valley. The endearing vignettes of youth becoming enmeshed and entranced by their efforts to improve their musical abilities mirrors Grohl’s own moments of preparation, frustration and perseverance as he sets out to accomplish his goal. The obstacles they face in their daily efforts to elevate and improve their abilities are no different than those faced by a world-class stadium rocker. When part two begins, the multiple visions of Grohl entering the studio set us up for what is a fascinating exploration of musicality by one of the most lauded musicians of his generation. Filmed in black and white by Brandon Trost (The Disaster Artist, This is The End), twelve roving mini-cameras capture an array of angles and movement around the studio. The lighting matches the dramatic peaks and valleys of this legendary instrumental, going soft and simple as the music transitions to its calmer moments, and becoming frenetic and electrifying as Grohl soars into passages of raw power. As with all Therapy’s work with Grohl, “Play” was built on collaboration. Editing duties were shared by Shannon Albrink and Jake Shaver, with Albrink casting a beautiful parallel between Grohl’s own quest alongside the narratives of young people embarking on their own musical journeys. Jake Shaver parsed an immense amount of footage (about 16 terabytes in total) to weave together Grohl’s purely one-take, single instrument performances. 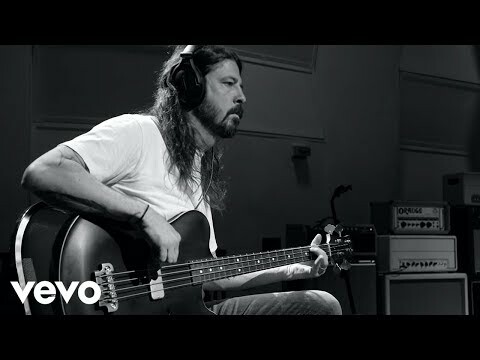 Use of split-screens effectively demonstrate the massive variety of instrumentation on display, allowing us to see and hear Grohl play every note, on every single instrument, all the way through in one 23-minute take. Darrell Thorp, engineer of Foo Fighters’ international #1 album Concrete and Gold, recorded Grohl’s performances over a span of three days, before handing the mix over to Therapy’s Eddie Kim and Brandon Kim. The pair polished up the moments of dialogue and performance segments, bridging the gaps and smoothing out the musical edits, volume, and noise floor to make it sonically seamless. Additionally Eddie and Brandon handled the recording of Grohl’s off-the-cuff narration, capturing his warmly familiar voiceover and his deft command of drawing audiences into his story. Lead flame artist/partner Wren Waters and flame artist Geoff Stephenson were responsible for compositing the multiple Dave Grohls – as many as six into a single frame. If a guitar was in the same place where a guitar-playing Dave Grohl needed to be, their job was to make that object disappear. Whether rotoscoping his hair flying mid-headbang or making sure the flickering lights were synced – continuity and creating a seamless visual remained front of mind for every shot. Finally, the monochromatic treatment by colorist Omar Inguanzo gives the film a timeless quality, bringing together the elements of light, motion and mood under one cohesive palette. Grohl has previously collaborated with Therapy on the Grammy-winning 2013 documentary Sound City, the Emmy and Grammy-winning HBO docu-series Sonic Highways, along with numerous Foo Fighters’ music videos. Additionally, the “Play” online interactive experience, allows the viewer the option to experience the mini-doc as is, focus on one instrument, and/or also download the “Play” sheet music.